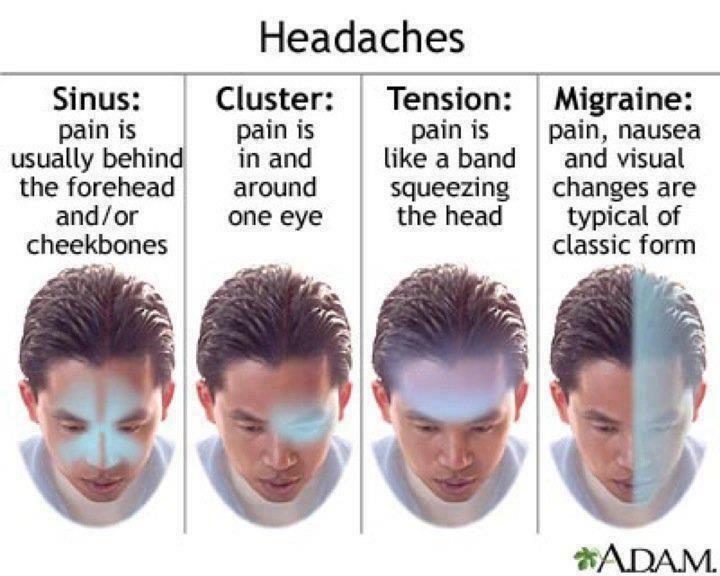 TENSION HEADACHE is most common these days due to stress, anxiety, too much strain or lack of sleep. According to Mayo clinic staff, "A variety of strategies can help reduce the severity and frequency of chronic tension headaches without using medicine." 4. Manage your stress level: organize & plan ahead. Maintain calender for activities. 5. Perfect your posture: Good posture can help keep your muscles from tensing up. When standing, hold your shoulders back and your head high. Pull in your abdomen and buttocks and tuck in your chin. When sitting, make sure your thighs are parallel to the ground and your head isn't slumped forward. CORRECT BREATHING TECHNIQUE to treat headache!!! close your right nose and use your left nose to breathe. In about 5 min, your headache should go. NOTE: Avoid pain killers unless its necessary. Don't take more than 9-10 times in a month & try to take care of the cause. Some common over the counter useful medicines are Advil, Aleve, Motrin, Excedrin. Other medicines like Tylenol or Acetaminophen etc may not be so effective & lead to medication overuse headaches. Here are some of the ways you can manage your headache and avoid taking medication. Doctors at Mayo clinic say that long use of pain killers make them ineffective & may make you addicted.